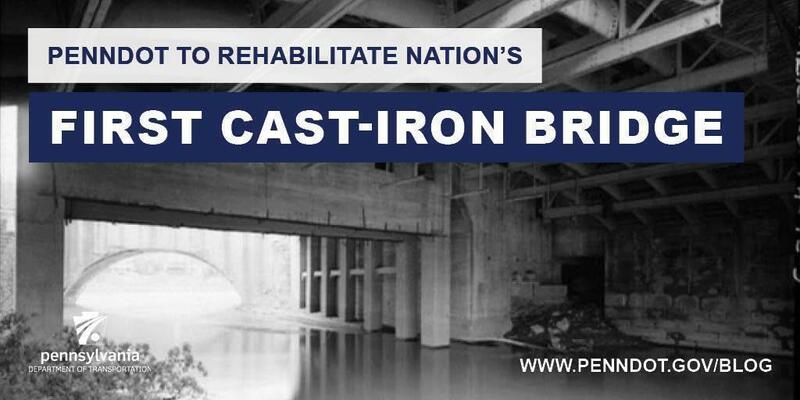 PennDOT plans to rehabilitate America's first all-metal bridge while maintaining the historic significance of the structure. The cast iron bridge, also known as Dunlap's Creek Bridge, is an 80-foot-span cast-iron arch in Brownsville. "Not only was Dunlap's Creek Bridge the first cast-iron bridge in America, it was the first metal bridge anywhere to use what its builder, Capt. Richard Delafield, U.S. Army Corps of Engineers, described as ‘standardized, interchangeable, manufactured parts.' The bridge was built as part of the federal government's effort to make repairs on the National Road before handing authority over to the states. Dunlap's Creek at Brownsville was an especially troublesome crossing, having destroyed three previous bridges since 1801." Dedicated July 4, 1839, and heralded as the first cast iron bridge built in the United States, it is still in use today with no weight restrictions. This bridge has received five historical and engineering awards. The project to rehabilitate the bridge will have early public involvement and coordination to provide alternatives that will preserve historic integrity and limit adverse effects. More on the bridge's historic significance can be found in an article, "Dunlap's Creek Bridge: Enduring Symbol of American Endeavor," (PDF) from the Transportation Research Board.